Grayson Perry is an award-winning artist. 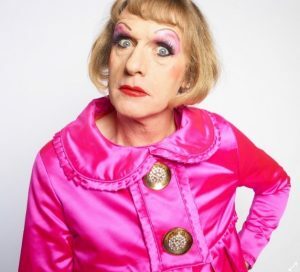 Grayson Perry is a Bafta-winning TV presenter. He is also a Reith Lecturer and bestselling author with traditional masculine traits including having the desire to ‘always be right and to overtake all other cyclists when going up big hills’. Join Grayson on the road in October and November to hear him discuss ‘cultural division’ in the topsy turvy world of Brexit, Trump and whatever else is thrown at us before November. An intelligent evening of laughs, discussion, insight and, of course, costume changes. Grayson Perry is an artist who works in a variety of media, including embroidery and photography, yet he is best known for his ceramic works: classically shaped vases covered with figures, patterns and text. Grayson was born in Chelmsford in 1960 and went onto study at Braintree College of Further Education and at Portsmouth Polytechnic. In 2003, he became famous as the first ceramic artist to win the Turner Prize and was awarded a CBE in 2014. Alongside his art, Grayson has written and presented documentaries including an hour-long documentary for Channel 4 entitled Why Men Wear Frocks, in which he examined transvestism and masculinity in the 21st century. In the programme, Grayson spoke candidly about his own experiences and the effect it has had on him and his family. The documentary received a Royal Television Society award for Best Network Production. His 2012 series All in the Best Possible Taste with Grayson Perry received a BAFTA for Specialist Factional Television. Grayson also went onto win a Grierson Award for Documentary Presenter of the Year.